Outsource2india provides independent evaluations of structural project designs to help clients enhance public safety of existing or new structures by ensuring there are no errors in the blueprints or engineering designs. Helping our clients with due diligence audit for various stages of the structural engineering project, we provide the opportunity to understand and optimize resources from the very inception of the project. Our team of skilled structural engineers and modelers have helped hundreds of architects, engineers, construction companies, as well as other related service vendors augment profitability and sustainability of the structures. With close to two decades of experience in providing engineering support to various clients across the globe which include several top Fortune 1000 companies. We have developed key communication, quality, and delivery strategies that immensely help our clients. 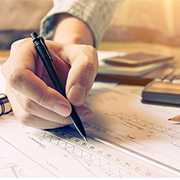 Understanding the need to ensure quality throughout the various complex phases of design, we have devised a thorough set of peer review services. As the field of structural engineering rapidly evolves, Outsource2india helps you stay aligned with the changing building regulations so that you can stay ahead of the competition. With our peer review services, we check existing designs from all required aspects of design adequacy, accuracy, and the possibility of risk mitigation. Our peer reviews are reliable and are performed by professional structural engineers with expertise in international building codes and regulations. We provide quality assurance, constructability, cost, risk management, or code compliance reviews, enabling safer and better execution of structural engineering projects. Foundation Design Review - Outsource2india provides a detailed review of all the geotechnical engineering aspects to ensure that the foundation design complies with building mandates. We also ensure the design is capable of handling tension, high compression, and shearing forces which can affect the lateral load-resisting elements. With this review process, our team helps clients to ensure durability, sustainability, and constructability of the foundation. Superstructure Design - Outsource2india provides a detailed superstructure review of the existing framing plans to study whether the section cuts as well as designations match required details, and the dimensions match the floor plans, etc., to ensure it is safety compliant. We also conduct lateral load path system tests through the building design to ensure each structure is designed with precision and details to meet building regulations for wind and seismic forces. Design and Specification Criteria Review - Our peer review also includes resolving conflicts between design drawings and construction material to ensure there are no gaps and the designs pass the building code requirements. This also ensures that the materials and specifications are relevant to the project and are not adding overhead to the project cost. Why Choose Outsource2india for Your Peer Review Assignments? Outsource2india has 20 years of experience serving local and international clients with structural engineering services. We offer highly reliable peer review services in India and rest of the world because our expertise is unmatched in terms of infrastructure and resources, ready to provide the most accurate evaluation of your engineering designs. Our knowledgeable experts come with decades of experience and can work along with you as an extension of your in-house team. We take up the responsibility to optimize peer review tasks so that you can be free from worries and focus on other important aspects of the project. Reach us today to understand how our skilled team can be a great value addition to your structural engineering projects.